This beautiful Morgan offers an unforgettable experience! You will enjoy the best Bahamas Snorkeling adventure that there is, all while enjoying the pleasures of sailing. 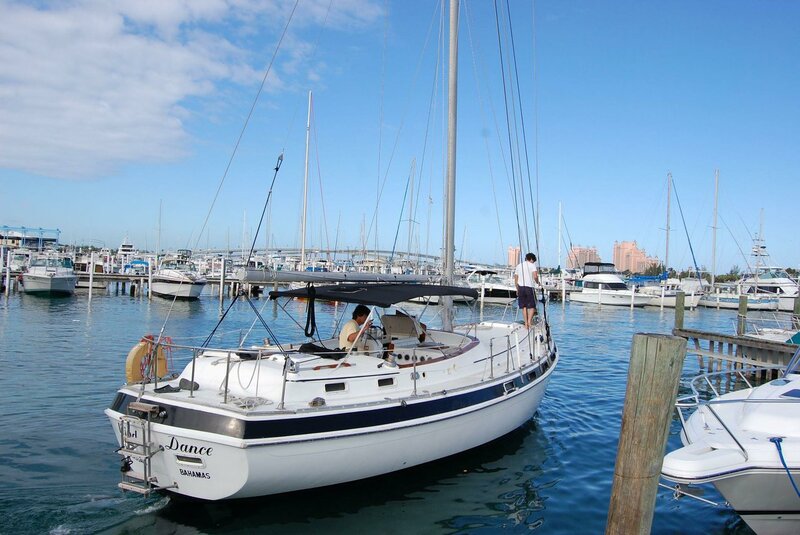 Picture yourself lying on the deck, under the white billowing jib enjoying the Bahama sun. Or you can sit in the shade in the cockpit beneath the bimini top. 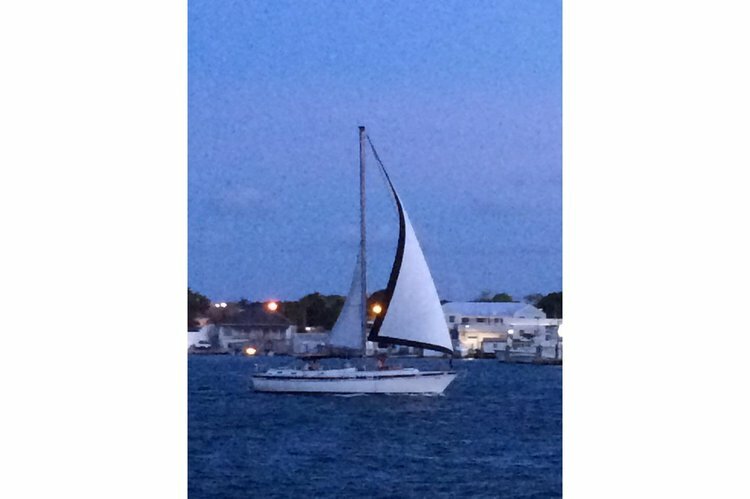 Listen to a great selection of music, the wind, or to the waves lapping against the bow. You'll find that this snorkeling adventures are the perfect vacation experience, like going to another world...!!! Itinerary - The cruise stops for snorkeling and/or beaching for about 2 1/2 - 3 hours, and there are about 2 1/2 - 3 hours of actual sailing time. The beach is gorgeous, and is at a secluded location, at nearby Rose Island. 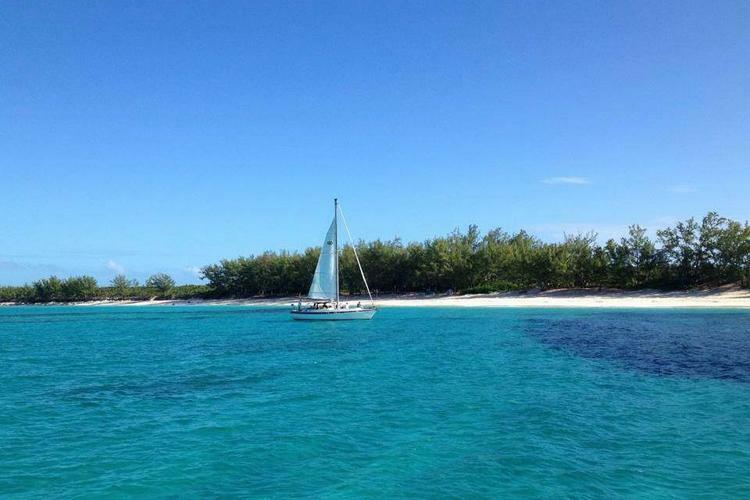 With this cruise the snorkeling is at a fantastic reef in a shallow reef location. You can snorkel from the sailboat, in 10-12' of water, or you can snorkel from the beach, so this is good for both experienced and beginner snorkelers. We bring a tender/small boat along as well, so you can also actually ride to the beach and not get wet at all, which is nice if you'd like to bring a towel or camera ashore, or if you can't swim. Snorkeling - We have lots of great snorkel gear on board which is included. There is also instruction in snorkeling, or refresher pointers, given by the crew upon request. There are swim waist belts (required) on board, and also life jackets are available (upon request). Snacks, lunch - we include coffee with danish, cakes & pastries in the morning, and fruit & chocolate platters in the afternoon. Our lunch is not catered - it is freshly prepared on board and grilled over charcoal with generous servings of our "secret recipe" BBQ Chicken & Ribs, Bahamian Baked Beans, Captain Randy's Famous Cole Slaw, and fresh dinner rolls from our local bakery, baked that same morning. Drinks - there are complimentary drinks - unlimited Rum Punch during the sail home, as well as unlimited fruit punch, iced tea, lemonade & bottled water during the entire cruise. In addition to the drinks which are complimentary (as described above) aboard our various cruises, we do have a cash bar. Sodas and juices are $2 and everything else (beers, cocktails, wine, Rum Punch) is usually $5-$8. With a private charter, if you have any special requests from the bar, let us know and we will provision accordingly. Itinerary - This usually begins at 9am or 1pm. The cruise stops for snorkeling and beaching for about 1 3/4 hours, and there are about 2 or 2 1/2 hours of actual sailing time. The beach is gorgeous, and is at a secluded location, at nearby Rose Island. 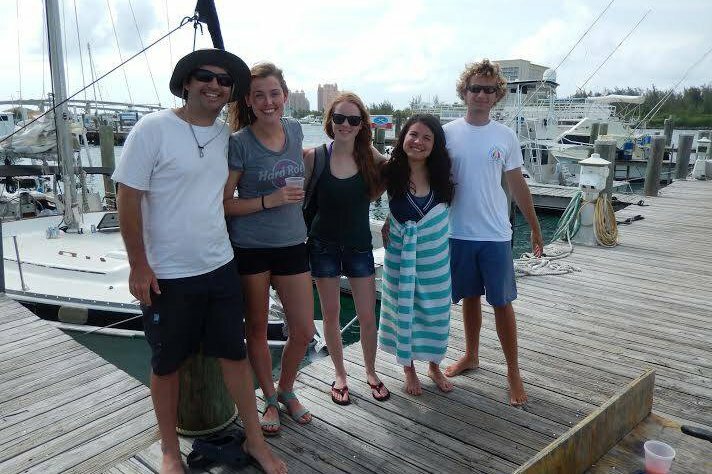 With this cruise the snorkeling is at a fantastic reef in a shallow reef location. You can snorkel from the sailboat, in 10-12' of water, or you can snorkel from the beach, so this is good for both experienced and beginner snorkelers. We bring a tender/small boat along as well, so you can also actually ride to the beach and not get wet at all, which is nice if you'd like to bring a towel or camera ashore, or if you can't swim. Snacks - we include generous cheese, salami, olive & cracker trays, along with fruit & chocolate snack platters, passed around by the crew several times during the sail home. You may bring additional snacks and/or boxed lunches with you, and also on private charters, if you would like additional snacks or lunches provided these are available at an additional charge. Itinerary - This usually begins at 9am or 1pm. 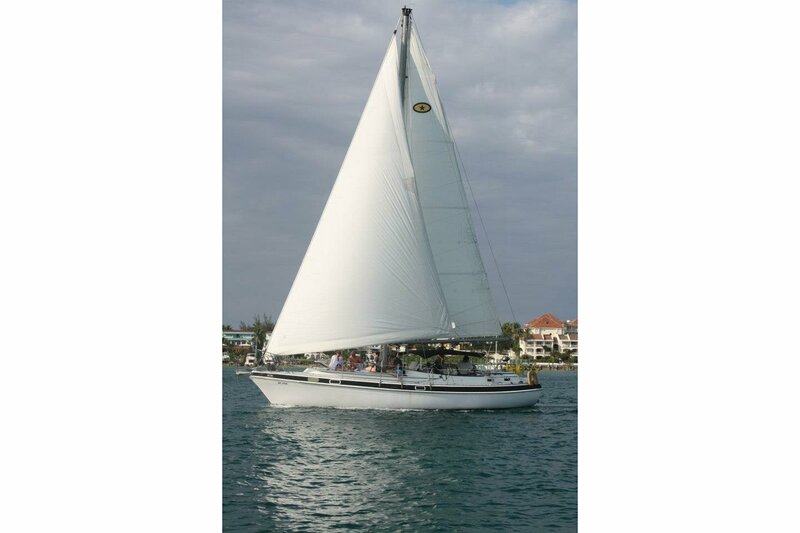 The cruise usually stops for snorkeling for about 1 1/4 hours, and there are about 1 3/4 hours of actual sailing time. 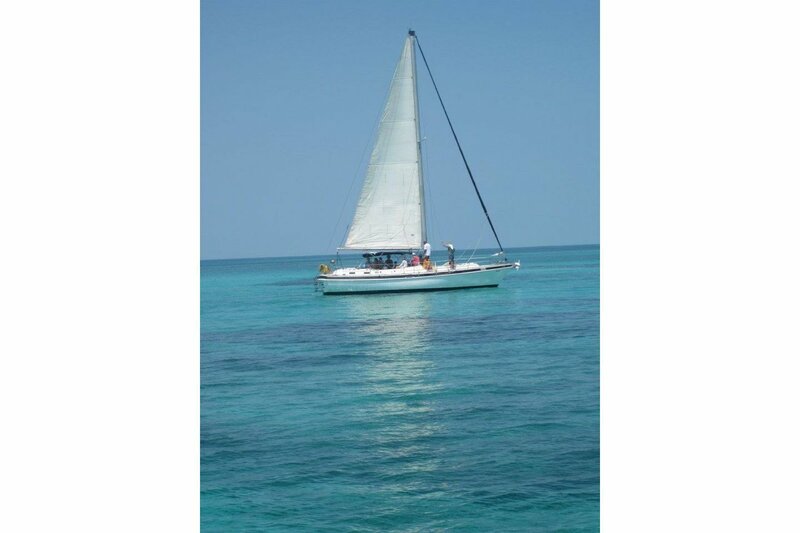 With this cruise you snorkel directly from the sailboat, in 10-12' of water, so very nice shallow water snorkeling, with the water even somewhat shallower over the coral. This is in an area at the Eastern end of Atholl Island, known as the Sea Gardens. You are actually anchored quite close to shore, to the island, however this is a coral/rocky shore line so there is no beaching on this cruise..
Snacks - we include generous cheese & cracker snack platters, passed around by the crew several times during the sail home. You may bring additional snacks and/or boxed lunches with you, and also on private charters, if you would like additional snacks or lunches provided these are available at an additional charge. Drinks - there are complimentary drinks - unlimited Rum Punch during the sail home, as well as unlimited fruit punch, iced tea, lemonade & bottled water during the entire cruise. In addition to the drinks which are complimentary (as described above) aboard our various cruises, we do have a cash bar. Sodas and juices are $2 and everything else (beers, cocktails, wine, Rum Punch) is usually $5. With a private charter, if you have any special requests from the bar, let us know and we will provision accordingly.